The Calgary Flames have kicked off their 2018-19 season with high hopes after a disappointing 2017-18 campaign. There are storylines swirling all around the club after an off-season that was defined by a lot of change. With the season underway, we’ve delved into the keys for the upcoming 82-game calendar and distilled them down to five predictions for the hockey club. In no particular order, here are our fearless forecasts. Tkachuk is heading into the final season of his entry level contract. Through his first two seasons, he’s put together a pair of productive offensive seasons while developing a reputation as both a responsible two-way player and an absolute pest to play against. 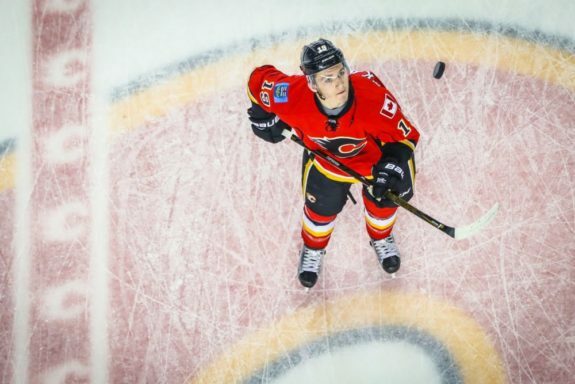 Tkachuk doubled his goals-per-game in his sophomore season – from 0.17 per game to 0.35 – and crept up the scoring ranks on the Flames, all while playing on a shutdown line that was snake-bit offensively. But during the summer, the Flames added to their depth. This theoretically will allow the club to be tougher to match against – making it difficult for teams to isolate Tkachuk when he’s on his game – but also bumping two-way stalwart Michael Frolik down the rotation a bit. All due respect to Frolik, but he was the weak link offensively on the Flames’ 3M Line that included Tkachuk and Mikael Backlund. Between depth, a slight upgrade in linemates and additional power play time, Tkachuk should creep towards the 30-goal mark – and just in time to negotiate a new contract. Reuniting Brodie with Mark Giordano was a big reason for the summer trade that sent Dougie Hamilton to the Carolina Hurricanes. The Flames received Hanifin in the deal and the thought at the time was the team could solidify their top two defensive units by putting Brodie back with Giordano and Hanifin with Travis Hamonic, Brodie’s partner from last season. 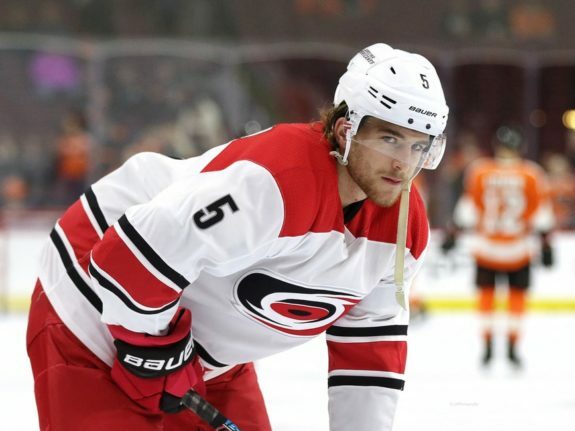 In addition to getting a lot of opportunities to improve his defensive play alongside a veteran shutdown blueliner, Hanifin is likely to be a big part of their offense moving forward. As the top defender on the club and a perennial Norris Trophy contender, Giordano (and Brodie) will get the tough assignments against the other team’s best players. That leaves Hanifin (and Hamonic) with the easier matches. Brodie struggled defensively at times last season, but moving him to Giordano’s pairing gives him both arguably a more suitable partner than he had last season but also a lot more challenging deployments. With Hanifin still emerging as an offensive player, likely getting opportunities on the Flames’ power play and getting a shutdown defender as his partner, look for him to generate more goals and points than Brodie. Smith is two things: he’s the Flames’ most important player heading into the 2018-19 campaign, and he’s their oldest player. He’s 36 years old, turning 37 in March. He’s missed time with lower body injuries in each of the past three seasons. But when he’s been healthy, he’s been very good – he was indisputably the Flames’ top player last season before his injury. The key for the Flames will be utilizing backup netminder David Rittich, especially in an October schedule that’s heavy on travel and road games. Smith, a fitness freak, will do his part to be ready for every game. But the Flames likely learned their lesson from last season and will do their best to save Smith’s best outings for the second half of the calendar. Look for his games to be more spread out and for him to avoid the injury bug this year. They struggled to win face-offs consistently. They struggled to gain entry into the offensive zone when they lost face-offs. They struggled to hit the net with their scoring chances. Their systems were far too dependent on Kris Versteeg (before his injury) and Johnny Gaudreau. As a result, a star-studded group really wasn’t all that intimidating. But the Flames have a new power play coach in Geoff Ward and new personnel that’s highlighted by James Neal, who has scored consistently for several seasons. Between making changes in their deployments, their tactics and their personnel, expect the Flames power play to leap back into the top third of the league’s special teams units. This outcome is largely contingent on the last two. If Smith is healthy for the entire season and the power play becomes, well, powerful, the Flames should be able to nudge themselves into a playoff spot after 82 games. The Pacific Division is insanely competitive, though, so odds are they’ll capture either the third spot in their division or one of the two Western Conference wild-card spots.